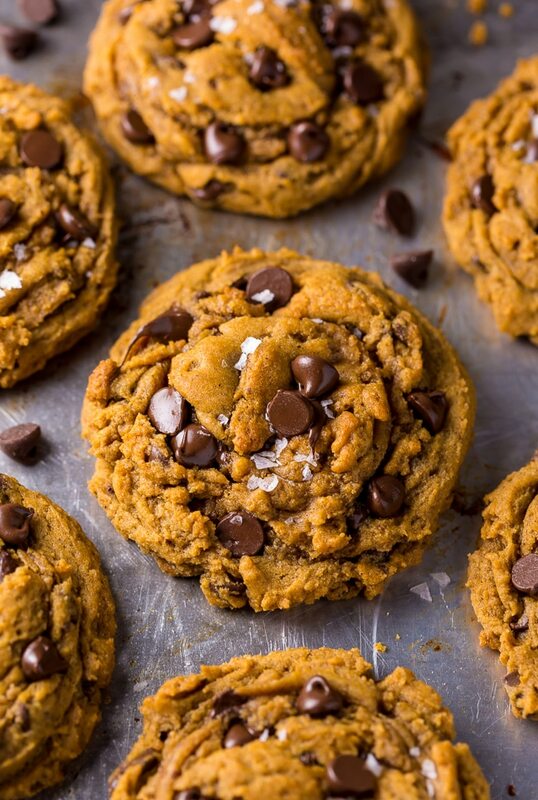 Say hello to the BEST Vegan Pumpkin Chocolate Chip Cookies ever! Do you have a can of pumpkin in your kitchen right now? 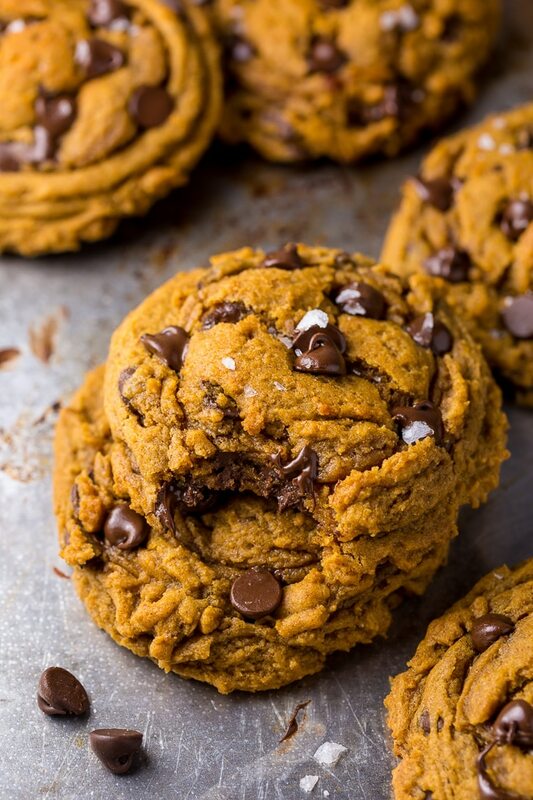 Please, tell me you do… because you’ll need it to make these easy pumpkin chocolate chip cookies! And trust me, you’re definitely going to want to make these beauties ASAP. First of all, let’s talk about texture! These cookies are crunchy on the outside and chewy on the inside. They are NOT cakey pumpkin chocolate chip cookies. But they do come out of the oven VERY soft. So it’s crucial to cool the cookies on the baking sheet for at least 30 minutes before serving. But if you can, I suggest letting them cool a full hour! The longer they sit, the firmer and chewier and they get. The silver lining is that these cookies taste even better with time! 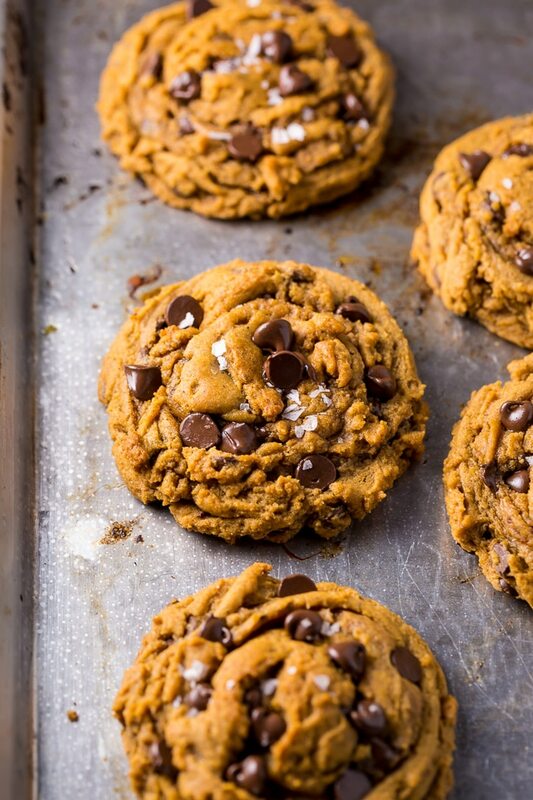 These pumpkin choc chip cookies don’t spread out too much while they bake, so be sure to scoop the dough into mounds, then lightly press down the top of the mound before baking. I make VERY large cookies with this recipe, and usually get about 1 dozen. However you can make smaller cookies, just be sure to decrease the bake time a minute or two. For extra pretty – and extra chocolatey – cookies, press a few chocolate chips on top of them right when they come out of the oven. You can also add a sprinkle of flaky sea salt! If you don’t like coconut flavor, you should use refined coconut oil, which does not have a coconut taste or scent. If you don’t have coconut milk, almond milk or soy milk will work fine! Finally, be sure not to over bake your cookies! As I mentioned earlier, they will be very soft when you remove them from the oven, but they firm up a lot while they cool. If you try this recipe for Vegan Pumpkin Chocolate Chip Cookies, let me know! Leave a comment below and don’t forget to snap a pic and tag it #bakerbynature on instagram! Seeing your kitchen creations makes my day. 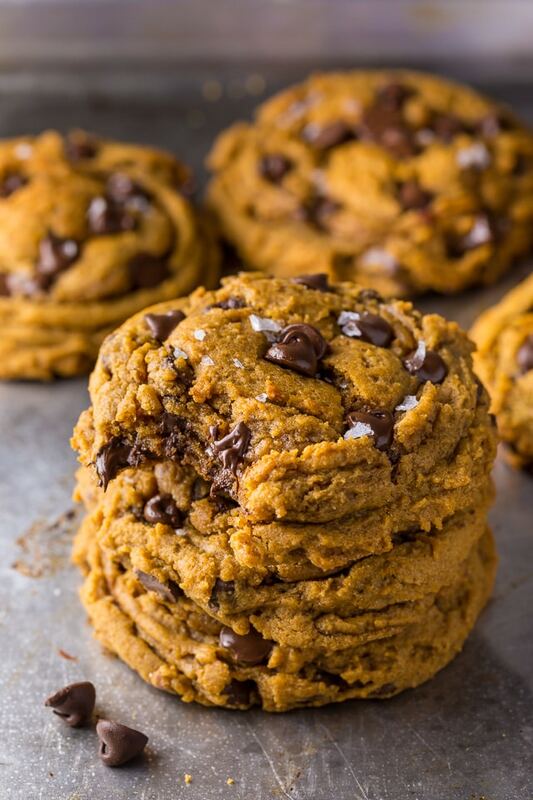 Thick and chewy Vegan Pumpkin Chocolate Chip Cookies! Loaded with flavor! Preheat oven to 375 degrees (F). Line a large baking sheet with parchment paper; set aside. In the bowl of a stand mixer fitted with the paddle attachment, or in a large bowl using a handheld electric mixer, beat the coconut oil, both sugars, and vanilla on medium-speed until smooth; about 2 minutes. Add in the molasses, coconut milk and pumpkin puree and beat on low speed until well combined. Turn mixer off. In a separate bowl combine the flour, baking soda, salt, and pumpkin pie spice; whisk well to combine. Add the dry ingredients into the wet mixture and, with the mixer on low speed, beat until ingredients are combined. The batter will be very thick! Fold in 1 and 1/4 cups of the chocolate chips. 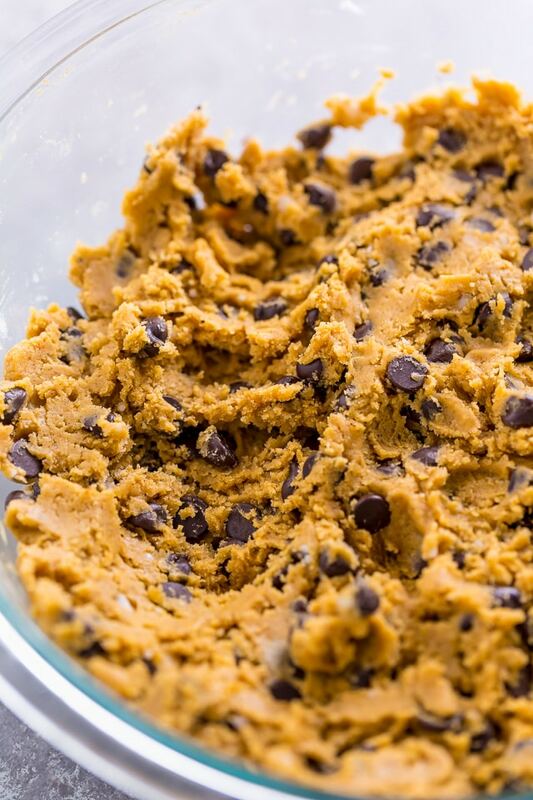 Scoop three tablespoon sized mounds of dough onto the prepared cookie sheet, leaving a few inches between each cookie. Bake for 9 to 10 minutes, or until the edges are golden and the centers are soft but set. Press remaining chocolate chips on top of warm cookies, and sprinkle with sea salt, if using. Cool cookies on the baking sheet for 30 minutes before transferring them to a cooling rack. Do you have any make ahead tips (Does the dough freeze well if we make it in advance?)? And how long will these last if properly stored? Your recipe says 1/3 pumpkin purée, does this mean 1/3 cup or 1/3 of the can?? I made these over the weekend and they were awesome! 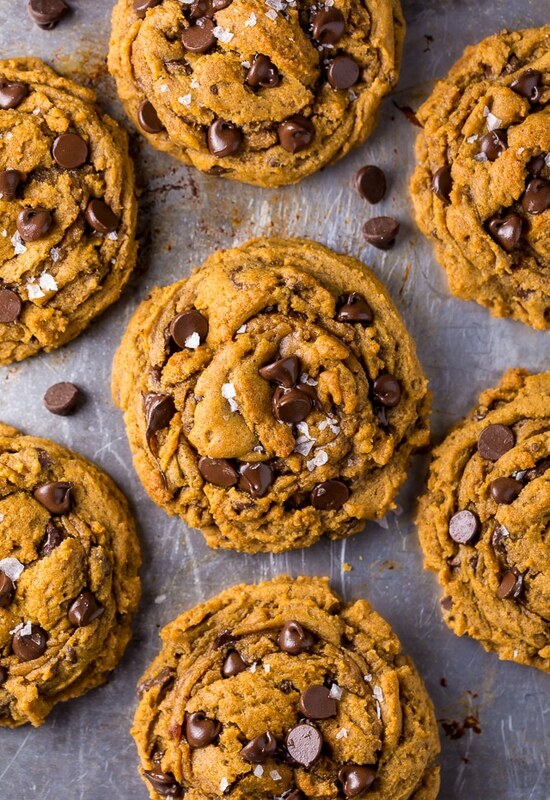 They’re my new favorite pumpkin cookie! Thank you for the recipe! Can you use maple syrup instead of the molasses ? I did and they came out great!! best cookies I have ever had! I used honey and the cookies turned out amazing! I think syrup/agave would maybe affect the integrity of the cookies because the consistency of those two are runnier than honey or molasses, but I’m really not an expert! These are delicious!! Just made them and they turned out great. Thanks for an easy, fantastic recipe! Could you use apple sauce instead of 1/2 cup of coconut oil? I was so excited to make these with my daughter, as we love trying new vegan recipes! They look so delicious and soft and chewy 🙂 Sadly, the ingredients are not 100% vegan, and that is a lot of sugar! The granulated and brown sugars are not vegan because granulated sugars (which is also what most brown sugars are made of) are processed using bone char, I know it’s gross and weird right? Ugh, well anyway, I wanted you to know. But Ill try to adapt a recipe from this one you have 🙂 Thank you! Fabulous! I had leftover pumpkin from our oatmeal oven pancake. Thank you so much for warning us about how soft they come out. I resisted the urge to leave them in longer–so glad I did. These are so yummy. I added some dried cranberries for a bit of tang. They’re perfect for our school’s fall bake sale. Is Redpath Sugar suitable for Vegetarians and Vegans? We do not use animal products or by-products in our refining process for sugar, so Redpath Sugar products are suitable for Vegetarians and Vegans. I made these cookies today and the flavor is great but they never hardened up. They pretty much fall apart. I’m not sure what happened. It looks like everyone else had good results. I usually don’t bake sweet cookies , i like mine healthy with barely any sugar , I had frozen pumpkin from last year . I modified the recipe a little . I didn’t use white sugar at all , just 2/3 cup organic brown sugar , did 1/2 cup pumpkin and 1/3 coconut oil I switched these 2 I didn’t want it to be to fattening , only 1 cup chocolate chips and 1/2 cup roasted walnuts and all organic whole wheat flour . They are very very good the texture of mine were crispy has I like my cookies hard not moist . I baked them 2 to 3 minutes longer . I got 19 cookies nice size about 1 big table spoon I patted flat a little . Next time I will bake them just the way I did but reduce the salt I thought it was to salty to 1/4 ts and reduce the sugar because they were sweet to 1/2 cup brown sugar . I usually bake with coconut palm sugar which is less sweet but I wanted to get rid of my brown sugar . I couln’t imagine adding 1/2 cup of white sugar . You have molasses , brown sugar and the sugar from your chocolate , so if you don’t like to sweet reduce the sugar but notthe molasses because it gives the cookies depth . Thanks for a great recipe that you can change to your needs. I always like to comment after making a recipe so it helps others in baking it . Made these last night, and I had just run out of brown sugar, so I subbed that with about 1/2 cup of maple syrup and subbed honey for the molasses. Added a couple extra tablespoons of flour because of the liquid sweetener sub. Used about 1 cup of chocolate chips. They still came out great! Thanks for this recipe! Man, oh man! This is our favorite new cookie recipe! ! ! These are amazing! I did reduce the sugar and cut the chocolate chips by half and they were perfect. My husband has a sweet tooth and is not vegan. He absolutely loves these also. They might be closer to the best we’ve ever had. I made this 2 days ago, made a batch on the spot and left half the recipe for later. I have to say the batch that stayed in the fridge tasted much better and had a nicer shape. The cookies are all gone now, I ate 6 cookies on my own and gave the rest away to friends who absolutely loved them. So so good. The only thing I did differently was that I reduced the sugar a little bit. I used 3/4 cup lightly packed brown sugar (110g) and 1/2 cup of organic raw cane sugar (100g). I am making another batch now for my husband and to have something delicious to snack on during the week. These cookies turned out to be absolutely fantastic! My party guests got into the raw cookie dough and were sandwiching the baked cookies between raw dough on either side. Thanks for posting! This will definitely be a recipe I use again. These were so good, thanks! I used a cup for cup GF flour blend and decreased sugar to 2/3c brown sugar and1/3c white sugar. Still deliciously sweet and my whole family loves them, yum! Between all my kids there are wheat, egg, and dairy allergies so it’s great to have a cookie everyone can enjoy. 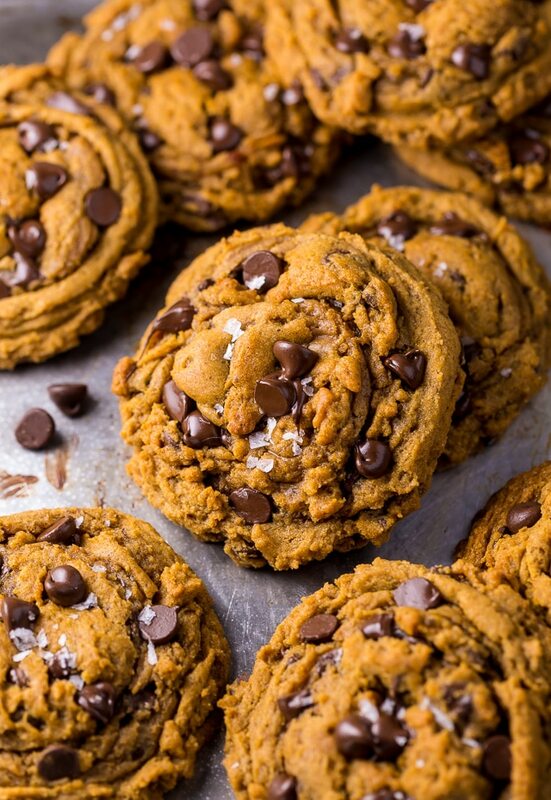 How are your cookies so orange with just 1/3 cup of pumpkin? Mine don’t look like that at all. Yay! So happy to hear that, Aisha! I’m not a big pumpkin lover but these cookies WERE. THE. BOMB. I think they are definitely my favourite choc chip cookie. I do have a question: when I baked some of these right away, they looked very much like your pics. The next day, I baked the remainder that had been in the fridge and for some reason, they spread more. Any ideas as to why this may have happened? These are absolutely delicious! I made them using a medium scoop (1-1/2 T) and the baking time was roughly the same (but I think my oven runs a little cool so take that with a grain of salt). Non vegans won’t know the difference and the vegans in your life will love you for these.